In the reality of the International Division of Labor (IDL), some countries specialize in only one or two sectors of the economy. This is the result of the historical process which created the world system. One Commodity Countries - many developing countries rely on one commodity for over half of their export earnings. Why? The law of diminishing returns encourages expansion . . .
Colonization is carried out for economic reasons. The IDL brought about a substantial increase in world trade and a surge in the overall size of the capitalist world economy. Mansa Musa of Mali - ruled over one of the richest and most powerful countries of the 14th century. Early Empires in West Africa - were concentrated inland around the grassland area of the Sahel. Unlike the North or East Africans, West Africans were more oriented towards the interior of the continent than to trans-oceanic trade. acquisition of ports in Africa. 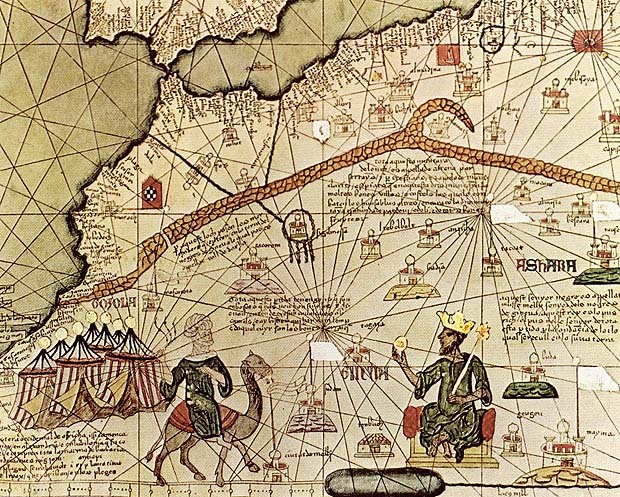 Africa has many barriers to internal colonization, so the merchants stayed mostly on the coast. Trade in natural products of the local region expanded and redirected indigenous production systems. Slavery drains the African population. Europeans and Americans need raw materials and food for the industrial revolution. State sanctioned acquisition of territory: the "Scramble for Africa." No Africans were invited or present. Notice of intent to lay claim in advance of military occupation. Disputes between European Powers were to be settled through arbitration in order to avoid conflict (amongst Europeans). Industrial colonialism involved the reorganization of production and infrastructure to meet colonizer's new needs. The core required supplies of raw materials and food, and a market for their products. Colonial economies were founded on the needs of the core countries. Political independence is accompanied by continued economic dependence. Extractive infrastructure geared towards raw material exports (primary products). for more than half of their export earnings. Ethnic identity and the modern nation state in Africa. VIDEO: Excerpts from "Clash of Cultures" - Foreign languages in Africa and Swahili poetic verse.